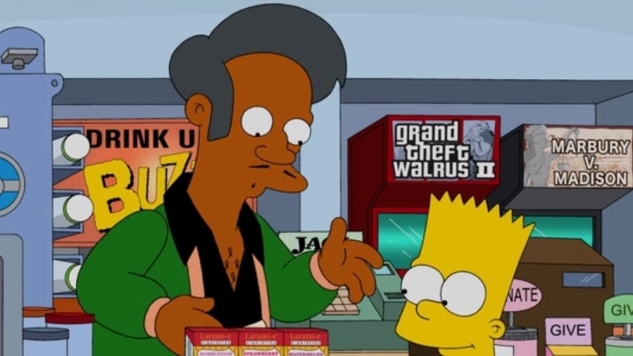 According to Indiewire, The Simpsons has quietly dropped the world’s most dependable Kwik-E-Mart owner, Apu Nahasapeemapetilon. Apu, of course, is an Indian-American caricature who has been a prominent Simpsons character since the show’s first season in 1990. Last year stand-up comedian Hari Kondabolu made a documentary about how Apu, as the most visible Indian-American character on TV, reinforced hurtful stereotypes about South Asian-Americans. It’s a thoughtful examination of the impact such racist depictions can have on real people, no matter how unintentional or unwitting it was on the part of Apu’s creators. Unfortunately Simpsons producers have generally had a disappointing and dismissive response to Kondabolu’s film. If Simpsons producers did decide to put Apu on the backburner three seasons ago, it makes you wonder why they went to the effort of mocking Kondabolu’s argument in an episode earlier this year. Quietly eliminating the character, or converting him into a wordless background character, might prevent any embarrassing or uncomfortable Apu moments in the future. It’s not the best way to address the problems that Kondabolu pointed out, though, or to show that they even understand what Kondabolu and other critics of Apu have been saying. Nobody from Fox or The Simpsons have confirmed that Apu has definitely been retired, but based on what Shankar told Indiewire, it definitely seems possible.